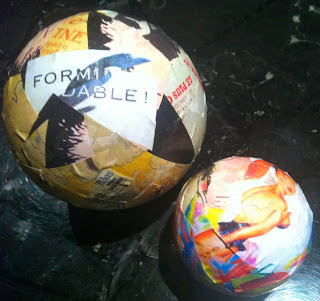 So you thought that Decoupage` was all about Victoriana images and antique music, didn't you. 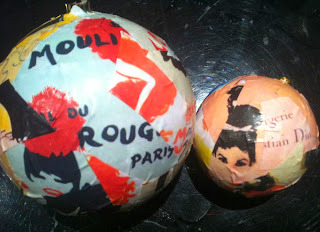 Here's my Modern French twist on Decoupage` Chrismas Ornaments. These were baubles that had seen better days, but I've since successfully used the project polystyrene balls to achieve the same result. 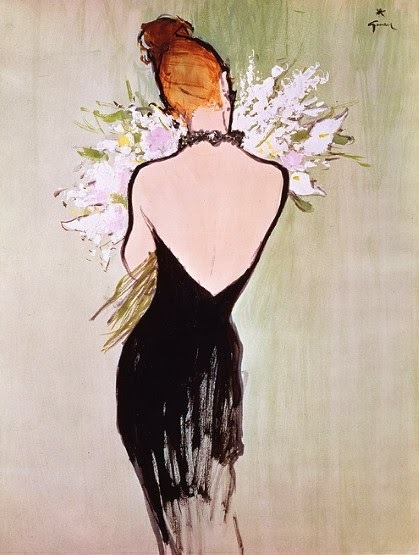 I downloaded and printed out vintage French poster images by Rene Gruau, a graphic artist and fashion illustrator I admire, and also found some fabulous vintage advertisements for Dior, The Lido, Vogue and others. 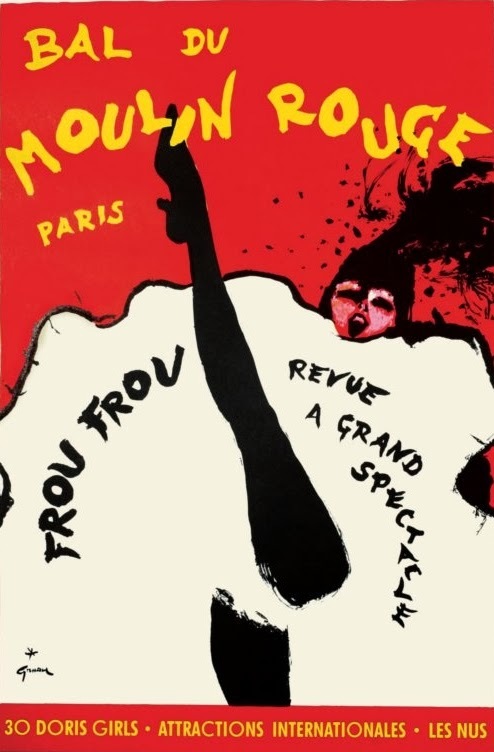 If you Google 'vintage French posters' you'll find lots of gorgeous stuff. 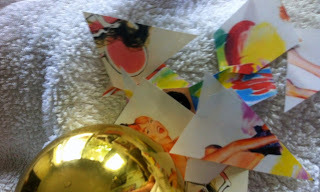 So, knowing nothing about the 'proper' way to decoupage`, I cut my images into all sorts of triangle shapes so that they'd be easier to apply to round surfaces. Then I simply painted my bauble with Royal Coat, (a bottle of which I'd had in my craft cupboard for about ten years from my previous flirtation with Victoriana images and wooden boxes), and started applying them. I didn't worry about creases, preferring to see them as part of the charm of the bauble. These are the reverse sides of the first picture in this post. Two coats of Royal Coat to finish and they were done. I thought about spraying them with glitter, as I do adore a bit o' bling, but decided against it, preferring the vintage look. The best thing about these, is they don't have to be stored after Christmas. Not being an obviously Christmassy montage`, means you can display them in a glass bowl, all year round. Love these!! Super cute. 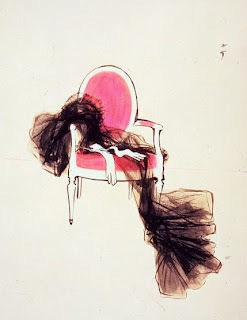 Decopauge is one of my favorite things! How cool! Very artsy looking! Thanks so much for sharing at Get Your DIY On! I hope to see you back on Sunday at 7 pm EST to link up any of your favorite projects! Have a wonderful weekend!